It’s an interesting thing, having your entire world turned upside down, and yet at the same time, remain exactly the same. This has been a horrible and devastating, normal week. After Tuesday, we still got up way too early, listened to Veggie Tales way too many times, and drove way too many miles to and from school. We had therapy, cuddled a lot, and giggled and cried. Grayson was adorable and difficult. Normal. Right after I called Ryan on Tuesday and broke the terrible news, I immediately took this picture and texted it to him. I just love this picture and can’t stop looking at it- how cute is my goofy toddler who had no idea he had just an hour before been given a crushing diagnosis? My family has received so much support this week and we are so grateful. Your blog comments, FB messages, phone calls, texts and prayers have made this awful news perhaps a little more bearable. 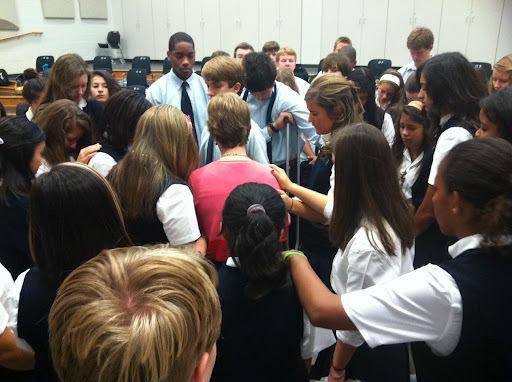 My mom took Wednesday off to spend the day with us, and when she returned to work yesterday her students spent the first few minutes of the day surrounding her in prayer. So many people around the world are praying and thinking about us and G and we feel so humbled and blessed. At the same time, I feel distant and removed from it all. I just can’t wrap my brain around it. I read and reread all your comments and it feels like I’m reading them about someone else. I just can’t believe this really could be true. How can this be true? This can’t be happening to my family, to my baby. I can’t even imagine him not being with us forever. I think about him leaving us and I start to cry, but I cry because I think, wow, that would be really horrible if that happened- not when it happens. Is this the denial stage of grief? I am seeing my counselor on Monday, and I want a plan. I don’t want to just sit on her couch and cry and feel sorry for myself- I can do that at home for free 🙂 I want her to help me find the best ways to go forward from here- to make the most of whatever time we have with Grayson- whether it be a year or many more. I spent the day with one of my closest friends and we talked a little bit about making the most of the time we have and creating special moments and memories. She suggested doing a photo a day. This probably won’t be too hard, considering I take so many as it is, although I am NOT a photographer. 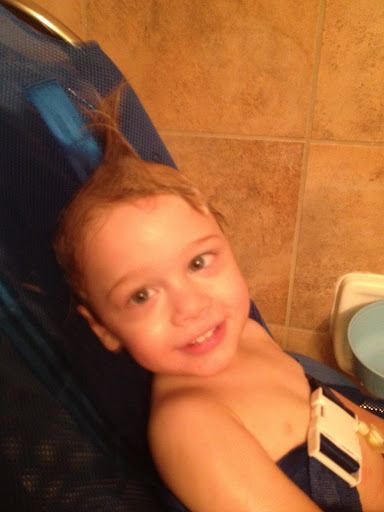 But I did create a little photo op during bath time tonight- I was singing and Grayson was laughing, so I gave him a shampoo mohawk. I love being silly with my G-Man. This weekend, we have plans to be normal. Ryan is coaching football, I’m working, and I’m taking Grayson to a birthday party for one of his buddies tomorrow. We’ll go to church, listen to a lot of Veggie Tales, and I’ll attempt to start organizing Grayson’s birthday party. And I’m hoping it doesn’t end this weekend- I’m hoping we can just be normal for long, long time. As hard as it is for the adults, isn't it just amazing that HE doesn't know and can just go on being Grayson without the weight of it all?Here's to hoping to a good long stretch of NORMAL for you. Normal is what I will pray for, for you all. And comfort. At some point, perhaps consider talking with someone from your local Hospice, mostly because they may have some awesome resources and ideas about how in the hell you do this (be normal, prepare, it all). The picture of your mom and her students is so moving. And G, as always, is full of light, life, and joy (and lots of awesome silly). What a cutie. Wishing you many years of "normal". Adorable pictures, he it too cute in that apple outfit and with his hair all crazy silly! And we will never wake up and think, oh my, I took too many pictures yesterday!! !…so keep on snapping! I'm glad for your normal weekend and am looking forward to spending lots of normal time with everyone in the future! I've been thinking of you a lot, Elizabeth, and actually wondered what it's like to go on like normal, because that's what you have to do, after such news. My husband reminded me that G is going to keep us smiling for a very long time – and that is so true! I guess you just keep keeping on, right? Because honestly, nothing has changed when it comes to all the wonderful things Grayson brings into your life. He's the same little boy he was on September 10th, and thank God for that! Much, much, much love your way! I love the wish for normality for Grayson. "This can't be happening to my family, to my baby. I can't even imagine him not being with us forever. I think about him leaving us and I start to cry, but I cry because I think, wow, that would be really horrible if that happened- not when it happens." I think that is such a "normal" reaction, in and of itself. With you every step of the way, however I can be. I don't even know what to say. But I want to make sure you know I'm reading and praying, and still crying with you. I had that removed feeling when I was taking care of my dad while he was terminal with cancer. I'm sure it's much worse with a child, but I always figured it was my brain's way of keeping me from having a complete and total emotional breakdown and ending up in the looney bin. Like I had to slowly allow the reality of it to sink in, because it was just too much to take all at once. I don't know. That might be way off base. Just thinking of you, wishing I were closer so I could do something more for you than just typing. Nothing is impossible with our God. He can move mountains and I feel like this mountain range is very large. But my faith is strong and so is yours. We will do this together and by God's Grace and Mercy we will overcome. I believe in prayer and that he answers our prayers. I love you Elibath more then words can ever express. Grayson is just too cute:) I LOVE his school outfit that has his name on the front in the apple. Elizabeth, I guess I'm a "lurker" here. I'm an old friend of Ryan's and have been reading your blog ever since he started making FB posts about the baby having troubles when they first started (he never gave details). I have been amazed at your honesty, wisdom, strength, and vulnerability throughout this journey, and I continue to be amazed as you face this most devastating development. I've been praying for you and your family and will continue to do so. God only knows what the coming seasons will bring, but I'm sure it will be full of unimaginable highs and lows and normals. I pray that you continue to feel the love of God that is also made manifest is the community (both physical and virtual) that is aching and grieving with you even as we have zero idea what all you are feeling and what you will be feeling. I don't remember when the baby is due, but I can also only imagine how that experience and expectation makes your feelings so complex. May you continue to find the safe spaces and support to fully express and feel all of it. And to have some times of blissful release. Blessings. Such a handsome little man! That photo of everyone praying for your mom (and you guys by extension) is so beautiful! You guys have been in my prayers, too. I've been thinking so much about you and your family. And these thoughts have been crossing my mind – how do they go on, just like normal? And I guess that's what you have to do. Keep going, keep operating like you did before, because what else are you going to do? I admire you so much for your strength, and thank you for sharing your feelings with all of us. I think it's a great idea to talk with a counselor about a plan. Continuing to think and pray for you and your family. I came over after reading Amber's post. 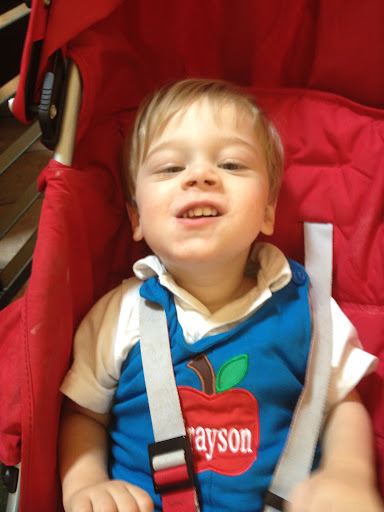 Grayson is SO adorable, and you sound "normal" to me in your grief process – whatever the heck normal is! I will be thinking of you…and of sweet Grayson. Hey! I haven't known what to say since I read your 9/11 post. I still don't know what to say except for that I'm praying for your precious Grayson. It is such an amazing blessing that Grayson has no idea that anything is unusual. And you are the best woman to be his mama. You give him so many wonderful opportunities for growth and enrichment and it's obvious by his sweet smiles that he's a happy boy.